The Islamic past plays an important rôle in the discourse of radical Islamists, who envision a revitalisation of the worldwide Muslim community. The memory of a united and powerful socio-political unit, as well as the great military triumphs of the early Arab-Islamic conquests, present radicals with a powerful tool for recruitment and mobilisation. In this approach, they are merely the most recent in a long line of political and cultural actors who have exploited and reinterpreted the history of early Islam in order to further contemporary interests. This article is a summary of a paper, ‘“Qadesiyoon of Sunnah Iran”: Early Islamic history and memory in radical Islamist discourse’, presented at the 6th annual conference of the Association for the Study of the Middle East and Africa, 21–23 November 2013, Washington, DC. Indeed, the discourse of radical groups reflects their recognition of the value of religious history and their efforts to harness its emotive power in contemporary political struggles. The initial battleground for these campaigns is that of collective memory and the nomenclature of these groups demonstrates their efforts to claim early Islamic history as their own. 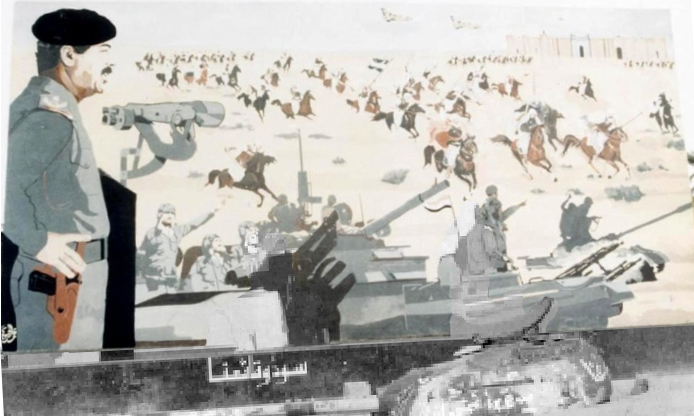 For example, the memory of al-Qādisiyyah has been used throughout the Sunnī radical world, dating back to the 1970s and 1980s, when a company affiliated with the Egyptian radical university groups and one of the Afghan ‘holy warrior’ (Ar. mujāhid, pl. mujāhidīn) organisations fighting the Soviet occupation took ‘Qādisiyyah’ as their names. Other examples involve training camps in Palestine, Yemen, and Afghanistan, Sunnī insurgent groups in Iraq, a terrorist cell in Yemen, a Sunnī anti-Iranian militant front in Iran, a radical media organisation based in Europe, a radical Islamist group in Pakistan, and a radical Islamist law court network in Somalia. Unlike Ṣaddām, who sought to bridge the differences between secular Arab nationalism and religious radicalism through his discourse, the radical groups have found new meaning in early Islamic history. From the history of early Islam, they distil the message of the ‘few against the many’ and the precedent of the victory of a small band of pious believers over ancient superpowers, which has proven successful in reassuring their fighters of ultimate success. A second major theme highlighted by radical Islamists concerns the total devotion of early Muslim warriors and their willingness to sacrifice themselves for the cause of God. In their efforts to recruit volunteers for dangerous operations and suicide missions, radicals have emphasised the example of pious Arab-Muslim warriors who embraced martyrdom and fought their enemies with blind devotion to their cause. These efforts to underscore a ‘love of death’ amongst the first community of Muslim believers have led radical preachers and guerrillas to reinterpret thoroughly early Islamic history. One such example concerns the poetess al-Khansāʾ, who lost her father and two brothers in pre-Islamic battles and all four of her sons at the Battle of al-Qādisiyyah. According to the traditional narrative, al-Khansāʾ mourned her father and brothers through her poetry, but, once she became a Muslim, she encouraged her sons to fight to the death and seek martyrdom. Later, when she heard the news that all four of her sons had died in the mêlée, she thanked God for gracing her with the quadruple honour. Unsurprisingly, radical Islamists have focused on this figure in their campaign to recruit fighters and suicide bombers, by appealing to devout Muslim women through the story of al-Khansāʾ. Numerous sermons and even a radical women’s periodical (named al-Khansāʾ) have sought to transform the figure into a sort of radical Islamist feminist, giving agency to the wives and mothers of jihadists as vital partners in the struggle against their enemies. In particular, al-Khansāʾ has gained notable currency among Palestinian radicals, who refer to her as the ‘mother of martyrs’ and present her as an example for Muslim women. Yet, this new memory of al-Khansāʾ, like much of the radical rhetoric, represents a total distortion of the history of early Islam. Some accounts that mention a woman whose four sons fought at the Battle of al-Qādisiyyah state that they all survived. Furthermore, the story suspiciously parallels that of a Jewish woman (sometimes called Ḥannah) whose husband and seven sons suffered martyrdom at the hands of a Seleucid king. What is clear is that the story of al-Khansāʾ, the larger Qādisiyyah narrative, and early Islamic history as a whole has undergone several transformations before reaching the hands of contemporary Islamists, whose use (and abuse) of her memory reflects the general appeal and value of religious history for mobilising and inspiring communities. These groups are just one type of socio-political actors trying to change the Middle East and Africa by ‘looking back and forging ahead’. Internet banner created by the Katāʾib Aḥrār ash-Shām (‘Freemen of Syria Battalions’), an Islamist group fighting in the Syrian civil war, depicting their cause as a ‘second’ Qādisiyyah. Source: Shabkat al-Jihād al-ʿĀlamī (Network of Global Jihād).